"ਸਕੈਂਡੀਨੇਵੀਆ: ਉੱਤਰੀ ਅਮਰੀਕਾ ਵਿੱਚ ਸਕੈਂਡੀਨੇਵੀਆਈ ਸੈਲਾਨੀ ਬੋਰਡ ਦੀ ਅਧਿਕਾਰਕ ਵੈੱਬਸਾਈਟ". ਉੱਤਰੀ ਅਮਰੀਕਾ ਵਿੱਚ ਸਕੈਂਡੀਨੇਵੀਆਈ ਸੈਲਾਨੀ ਬੋਰਡ, ਗਲੋਬਸਕੋਪ ਇੰਟਰਨੈੱਟ ਸਰਵਿਸਜ਼, ਇੰਕ. 2005. Retrieved 5 September 2008. ↑ "Scandinavia". Encyclopædia Britannica. 2009. Retrieved 28 October 2009. Scandinavia, historically Scandia, part of northern Europe, generally held to consist of the two countries of the Scandinavian Peninsula, Norway and Sweden, with the addition of Denmark. Some authorities argue for the inclusion of Finland on geologic and economic grounds and of Iceland and the Faroe Islands on the grounds that their inhabitants speak North Germanic (or Scandinavian) languages related to those of Norway and Sweden. ↑ Saetre, Elvind (1 October 2007). "About Nordic co-operation". Nordic Council of Ministers & Nordic Council. Retrieved 9 January 2008. 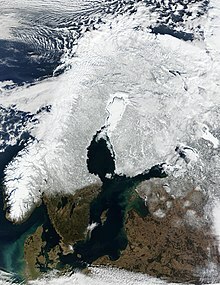 The Nordic countries consist of Denmark, the Faroe Islands, Greenland, Finland, Åland, Iceland, Norway and Sweden.